While the nation celebrated the 150th birth anniversary of its national hero, Jose Rizal, and the tallest monument in his honor was inaugurated by none other than President Noynoy on June 19, another equally significant milestone unfolded in the birthplace of this iconic leader, the City of Calamba. 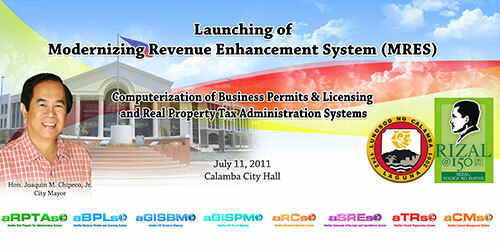 On July 11, the City Government of Calamba formally launched the Modernizing Revenue Enhancement System or MRES Project. 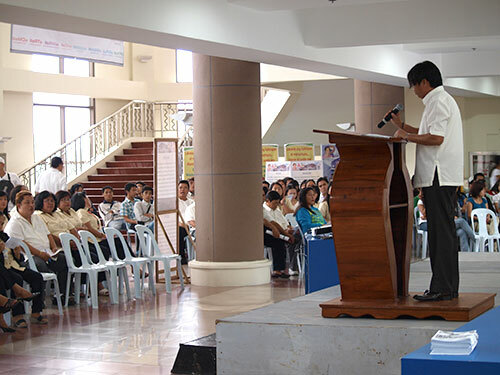 The event was held in the City Hall lobby led by the Honorable Mayor Joaquin Chipeco, the Project Management Board, and attended by officers and staff from the City Treasury Management Office (CTMO), City Assessment Office (CAO), the Bureau of Permits and Tricycle Franchising Office (BPTFO), and Amellar Solutions, headed by Mr. Manuel S. Tabunda and Cris Padilla Tagle. 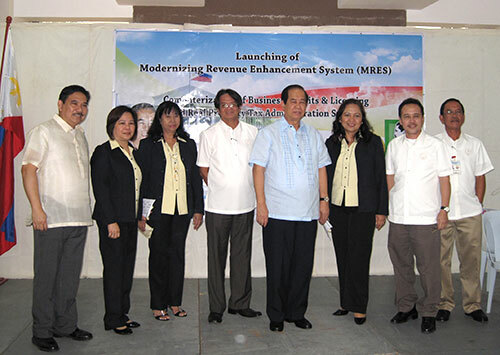 MRES covers the automation of Calamba’s Real Property Tax Administration and Business Permits and Licensing Operations, as well as Tax and Business Mapping. Amellar Solutions will partner with the City in implementing these systems within an eight-month timeframe from April to December 2011. 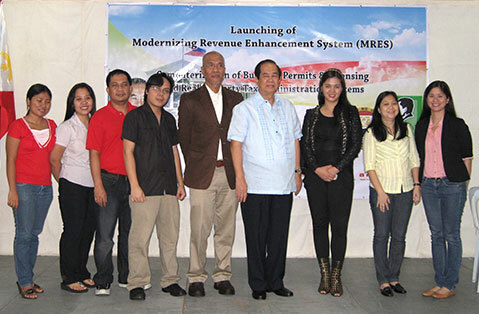 Official launching of the completed systems is on January 2012. Mr. Dennis Lanzanas, Chairman of the Project Management Board, formally opened the event on a positive note, saying that by means of MRES, operations in concerned offices will be automated, therefore making transactions 100% easier. Calamba’s revenues will also increase by 20% – 30% in just the first year of implementation which, in turn, will translate into more programs for the Calambeños. 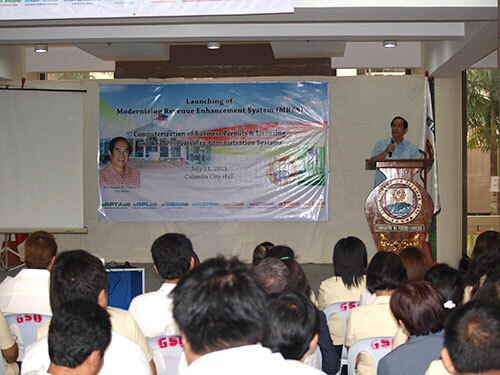 He encouraged the participants to view this change as a welcome and challenging one as the City of Calamba gets introduced to the new computerized systems. In his privilege speech, Mr. Tabunda, CEO of Amellar, commended the Honorable Mayor for taking a bold but calculated step towards E-Government, despite vile criticisms from his political opponents and even doubts from his allies. He thanked Mayor Chipeco for his decisiveness and resolve to implement the project despite political odds, and promised to make full use of Amellar’s talents and resources to ensure its success. Efficiency, Effectiveness, Accountability, and Transparency are the four time-tested strategies which Amellar will apply to the MRES Project. 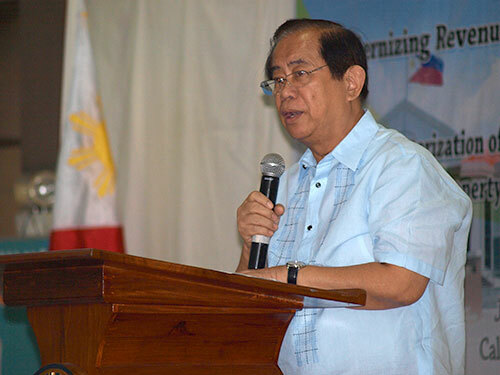 View speech of Manuel Tabunda here. 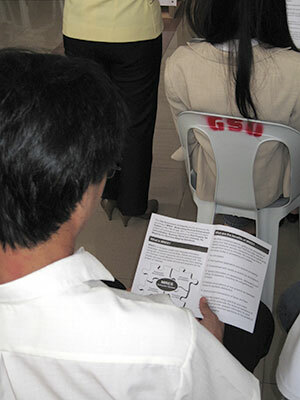 Allan Javier, Assistant Project Manager, provided a quick preview of the coverage and activities of the Project. 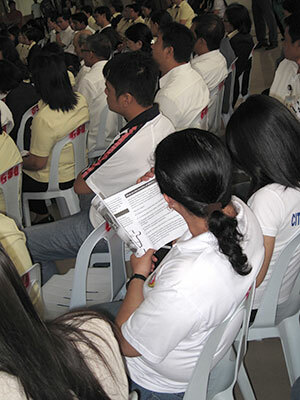 Rachelle Borja-Consul, Marketing Manager of Amellar, then showed samples of significant revenue increases experienced by a number of Amellar’s clients due to computerization. Randy Sanglay, R&D/RDBMS Manager, briefly outlined the top of the line computer hardware delivered to the City. Finally, the Honorable Mayor stepped up to the podium to deliver his speech. 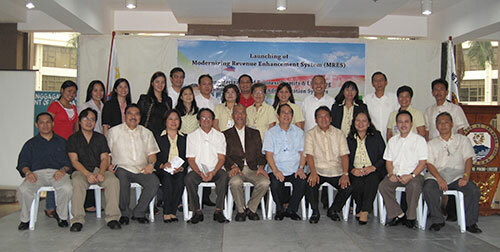 He expressed high hopes for the Project and expects it to modernize Calamba services and improve customer service as circuitous processes are eliminated and processing time are reduced. He said that with the computerized systems, undeclared revenues will be discovered and revenue collections will increase. 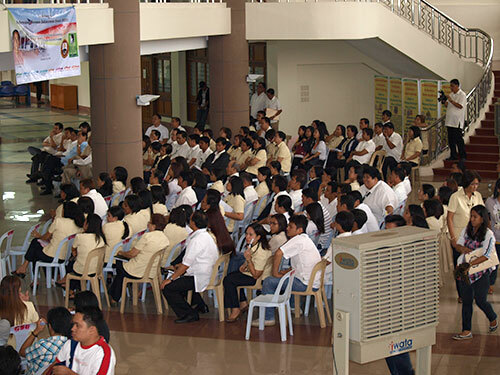 These will translate to more programs for the City which would attract more investment and more employment opportunities for all Calamba residents. 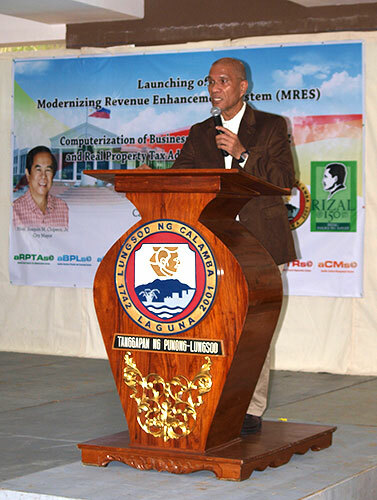 He enjoined everyone, especially the PMB, to closely monitor the progress of the Project as Calamba goes through the transition from manual to a computerized system. With the record-breaking 22-foot tall Rizal Monument, the construction of a 6.7 hectare Rizal Park, its status as a guiding force of Progress, and now, the MRES Project in its belt, Calamba is indeed not far from its goal of being the next Makati of Southern Tagalog. The event was also attended by the Project Management Board of Calamba, as follows: Mr. Luisito Jimenez (Project Coordinator), PMB Members Atty. 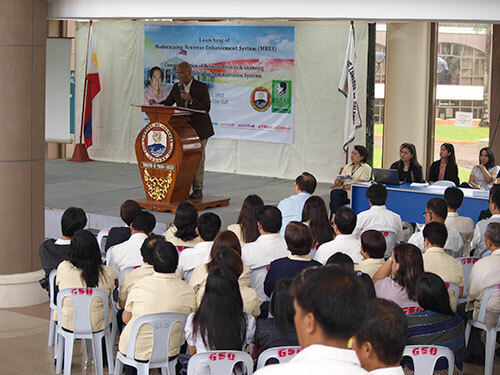 Desiree D. Improgo (Legal Officer IV), Ms. Gregoria A. Dongallo (City Budget Officer), Graciano Aldabe (City Assessor), Liberty Toledo (City Treasurer), Ibarra Encarnacion (BPTFO Chief). Amellar officers and staff, as follows: Cristy Palma (Production Manager), Tricia Oriel (Principal Partner Support Analyst), Cris Boneo (Partner Support Assistant), Efren De Guzman (Assistant Production Manager), Elvin Matabang, Sr. (Data Specialist), Ruby Dotimas (Data Specialist Trainee).